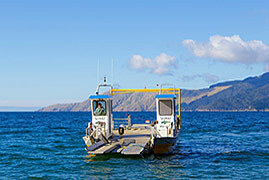 D'Urville Island to French Pass Barge Crossings: Cross the French Pass waterway straight to Kapowai on d'Urville Island with our barge vessel service. If you'd like a day trip - we can carry your vehicle to d'Urville Island where you can drive around and see the sights, including the scenic reserve yourself. 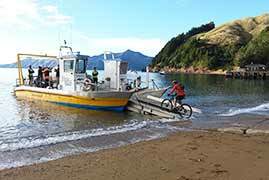 Or if you're a keen mountain biker, get a group together and come ride the d'Urville Island's tracks and experiencing the stunning scenery here on the island. 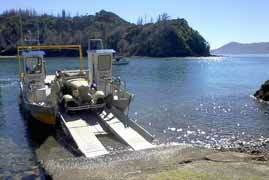 or to stay at the d'Urville Island Community Hall (for bookings contact Sue Savage 03 5765 170). 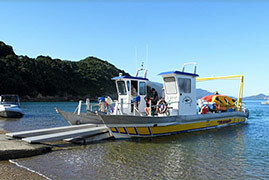 Service providers can also travel direct to farms or families on the Island, as required. We can take mountain bikes, 4x4 bikes, trucks, trailers, small tractors and small diggers. The barge is also surveyed to carry up to 25 passengers. For other destinations or cargo, please contact us. We welcome your enquiry.